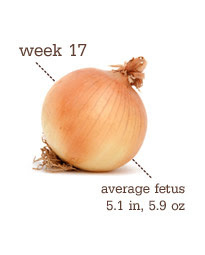 This week: Your baby is forming brown fat deposits under his/her skin, by the end of pregnancy this will account for 2-6% of your baby's total body weight. This will help him/her maintain their body temperature when they are born. The baby now weighs more than the placenta does! Your baby's skeleton is hardening and changing from cartilage to bone, and fat is finally accumulating around it. The umbilical cord is getting thicker and stronger, and those little fingers and toes are topped with one-of-a kind prints. I'm thankful for another healthy week! !